Today, Christmas Day, I picked up the book – Sapiens: A Brief History Of Mankind – that I have been reading for most of the year. The Ericle is indeed not the swiftest of readers but, even by my standards, I have spent a great deal of time with this book. However, in this case, this has not been a case of dwindling concentration or tiring eyes. I have taken my time willingly and purposively as a result of Sapiens being one of the richest and most illuminating books that I have ever picked up. Virtually every page yields analysis and insights, such that after a few page-turns I have put the book aside in order to dwell on thoughts that have been evoked. The history of ethics is a sad tale of wonderful ideals that nobody can live up to. Most Christians did not imitate Christ, most Buddhists failed to follow Buddha, and most Confucians would have caused Confucius a temper tantrum. In contrast, most people today successfully live up to the capitalist-consumerist ideal. The new ethic promises paradise on condition that the rich remain greedy and spend their time making more money, and that the masses give free rein to their cravings and passions – and buy more and more. This is the first religion in history whose followers actually do what they are asked to do. How, though, do we know that we’ll really get paradise in return? We’ve seen it on television. My reader may have noted that much of what I prattle on about is related to my perceived belief that we are living in times when there is a discernible disconnect between the lives we are leading and the palpable realities of the world in which we are living them. It is surely clear to any right-minded person that any of the 20th-century models, by which we have existed, are on many dimensions quite simply not fit for purpose. They not only will fail us, in all likelihood, they will destroy us. Sapiens expresses and expands on such thought most persuasively and brilliantly. The good news is that Sapiens has topped the non-fiction books best-seller chart for the whole of 2017; so, hopefully, there is a growing groundswell of people who have been affected and motivated by reading the book. 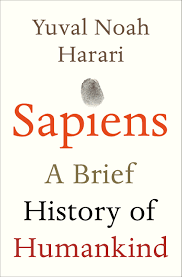 If you haven’t picked up a copy of Sapiens yet, I strongly recommend that you do. I am almost at the end of the book now, which is a fortunate thing as the sequel Homus Deus is on my Christmas wish list. At the time of writing, I have no idea whether this wish has been realised. This fact notwithstanding, I most surely intend to read Homus Deus in 2018 and I have little expectations of there being a happy ending! Merry Christmas! Fantastic way to spend the day .. my own copy has been usurped by none other than Ben, so I have not begun the journey. But your article inspires me to … perhaps it will make fine island reading!